PRODUCT DESCRIPTION: Glue trap which uses sexual pheromones as attractants and is set out where you either have activity or suspect activity. Emerging adults will find the trap, enter and get stuck on the glue catching them before they are able to mate and lay eggs. Excellent monitoring device which should be used in conjunction with the other treatments listed in our on line article. 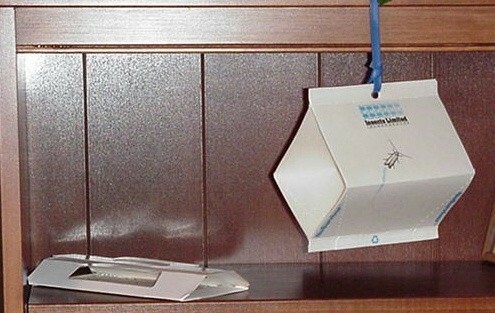 These traps come in two styles, the one on the left side of the picture is the Low Profile and the trap on the right side is the Hanging Style. WHERE TO USE IT: Anywhere in the home where activity has been found. The Low Profile design is good for use in cabinets, bookshelves and pantries. The Hanging Design which should be placed in more open areas where adults have been seen flying around. RATE OF APPLICATION: Try to set at least one out in every room where you have seen activity. When using in closets and cabinets, be sure to have one in every sealed compartment. If adult beetles have been seen flying around parts of the house like garages or laundry rooms, be sure to place traps in line with such activity. The Pheromone is not detectable by people or pets but will surely be found by the targeted insects. Be sure to inspect them once a week and replace as they fill with insects. Most traps will remain active for 2-3 months so replace them after this time period even if they are not filled. However, if the trap fills in 2 weeks, be sure to replace it as soon as there is no more glue area on which adults can get caught.